I'm far from a stickler about my car's appearance, only getting the rare car wash typically in winter time when my car gets coated with salt. However, this past week I had parked my new Subaru Legacy under a tree for the day only to find it coated with these little balls that had fallen off. Apparently I parked under one of the annoying Bradford pear trees which shed their seeds this time of year. They look like little cherries almost - purplish in color. 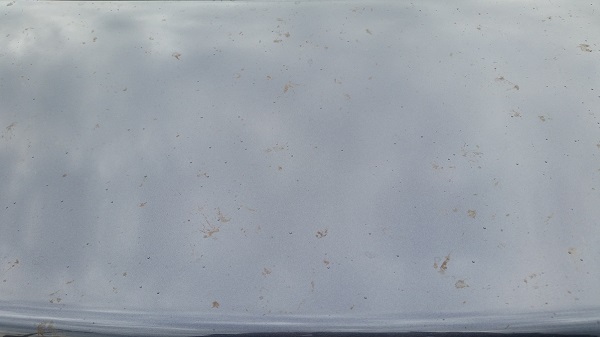 I took my car to a regular car wash a few days later and my hood and trunk were covered with brownish purple spots all over. Whatever those seeds have in them must be pretty strong and toxic. I looked online and found a bunch of suggestions for tree sap removal but only a few about these pear seed balls. For sap, aside from commercial products, it seems that most people found the most success with rubbing alcohol. People also reported success with WD40, but there was one video online that found the rubbing alcohol worked noticeably better on tree sap. I got home and gave the rubbing alcohol a try. It had almost no effect. After letting it sit for a minute or two, and rubbing a little, it was soft enough that I could scratch it off with my fingernail. This was definitely not going to be a workable solution as my car was covered in about 100 of these little spots. It'd take me hours to do this. From what I could read, both rubbing alcohol and WD40 should be safe for car paint, not damaging the clear coat. They will probably remove any wax down to the clear coat, so it is recommended you apply a layer of wax after using these agents. I wasn't thrilled with the thought of having to wax my car on top of removing all of these little spots. I looked into detail shops in my area to see what options I'd have and get an idea of the cost and time it would take. It isn't the most convenient thing to have to drop your car off somewhere for a few hours, unless you can get someone to give you a ride back home or to work, etc, and then pick you up to take you back to the detail shop. Reading reviews about detailing services is frightening. Almost every place near me was filled with at best a mix of positive and negative reviews and at worst, a vast majority of negative reviews. I did call around to one that wasn't that bad and he said that he'd have to look at my car to give a clear estimate, but he said they have a tree sap removal service that can cost anywhere from $25 to $150 depending on how extensive the sap is. I asked if that covers waxing the car afterwards and he said that would be extra, but he recommends doing that. 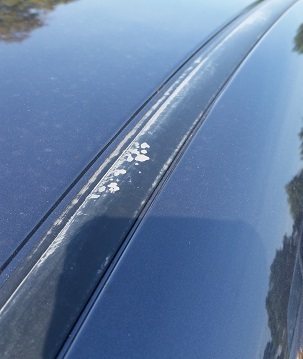 Since I found the marks on my car pretty tough to remove, and there are tons of them, I figured my car would come in at the high end of those estimates. I didn't have time to take my car over for him to look at it, but I figured I would over the weekend. The next day, at work, I decided to check out places near work. I knew of one car wash near my work and I had heard they would be willing to drive me to and from work if I left my car there. I went during my lunch break to see what they though and to see how much it would cost there. The detailer took a look at it and said he wanted to see how hard it would be to remove. He came back with a spray bottle that had "goof off" written on it. He sprayed it on, and wiped with a white cloth and amazingly, the stuff came off with only a little effort. He said that he could remove the sap from the trunk and roof for $65 and he'd also wax it. 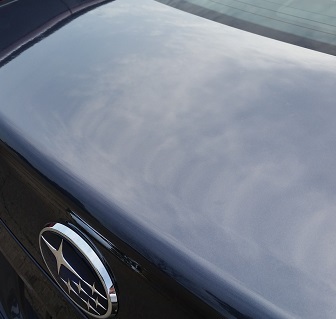 He said it might be worth me doing the full exterior detail which includes a "clay bar" treatment and would be much more complete, but that is $105. He said the exterior detail takes about 4 hours and he couldn't do it that day but said he could do the sap removal, estimating it would take about 90 minutes or so. Since my car is only 2 months old, I really didn't think I needed the full exterior detail and I really just wanted this done, and it was cheaper. I said go ahead. About 45 minutes later he tells me that he's tried everything on the trunk area, including "clay barring" it and while the sap is gone, there are still visible marks left where the seeds were. He showed it to me and it was totally smooth to the touch, but at most angles in the light of his shop, you could see lots of discolorations everywhere the seed balls had been. He said he's look up everything to see what he could use and just as we were talking he got a text back from someone. He then went and got a bottle labeled "goo gone" and sprayed that on the trunk. After wiping it off, the discolorations were still there. Not good. He said he can go ahead and do the roof but it would have the same issue. I said to just go ahead and do it. I went back to work and after a total of 3 hours work, he was done. He must have run out of steam at some point because parts of the roof still had some residue that I could feel, but the car was definitely much much better than before he worked on it. Unfortunately, he pointed out that the chemical he used had damaged the rubber strips in the roof of the car. On one side it actually looks like the rubber had an abrasion, like a grinder of some sort had been against it. The other side has discolored spots on the rubber. He quickly said he would fill out a damage report and I should take it to get an estimate to have the rubber strips replaced and then they will pay the cost. So, if you want to try this yourself, I'd suggesting getting "goof off" but be careful when using it near non-metal parts like rubber or plastic as it will ruin it. I did see one forum post afterwards that said "goop" works well for the pear residue. I would suggest doing it ASAP after noticing the little buggers, since it appears there is something in them that chemically reacts with the clear coat causing a discoloration. Once that happens, I'm not sure what would be involved in having a complete fix. As I said at the start, I'm not a total stickler for my car's appearance, but it is still annoying to have a 2 month old car that has some paint issues. Fortunately, it is only noticeable under certain lighting and even then it just looks like subtle water spots on the finish. Since I don't keep my car totally clean, I doubt anyone will notice. I'll try to post some pictures when I have a chance. Interestingly, I did find someone else who had the same experience - but his was a new Tesla. I'd be much more upset if my car were a Tesla. I got around to uploading a few pictures. I'm not the best photographer, but this should give a little bit of an idea of what I'm dealing with. 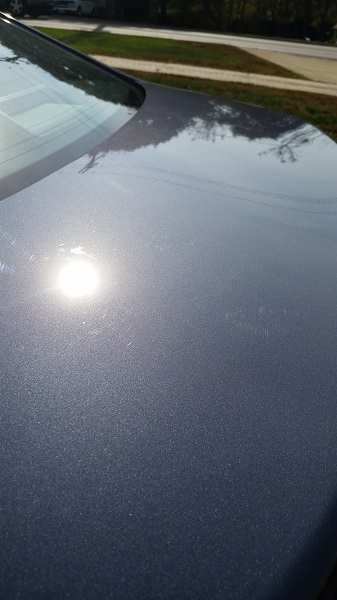 First, here is a picture of what the sap / seed remnants looked like after a standard car wash, before any detailing work was done. 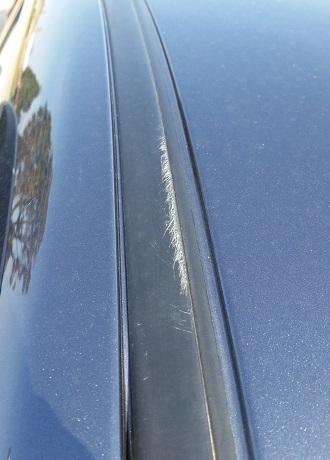 Here is a picture of the rubber strip on the driver's side of the car. To me it looks like some sort of abrasive was rubbed against it, but the detailer claims it was from the chemical compound (although he initially claimed he saw this damage before he even started the work - but later changed his story). And here is the rubber strip on the passenger side of the car. This looks more like chemical discoloration. From this angle and lighting, you can also see some of the remaining defects in the paint to the left of the rubber strip. I had a really hard time getting photos of the remaining defects. You have to be at just the right angle to see it and I wasn't able to get a good picture of it. When I do see the remaining defect now, it basically just looks like water spots. Additionally, I've noticed that my car seems to get dirty really fast where I live, probably made worse by the road construction going on right now. With a little dirt on my car, I can't even see the defects so I'm not going to worry about them too much. When I took my car to an auto body shop about the damaged rubber strips, the guy said he could try wet sanding it down to see if that helps, but I'm guessing that might cause more problems than it'll solve. Interestingly, he did ask me if I had gotten any type of the special paint protection package the dealer tried selling me when I bought the car. I told him I didn't bother since I heard they don't really do anything. He said that it's true that the protection doesn't actually do anything, but he asked because he said the guarantee that would come with it may cover any needed repair work. So - the bottom line in all of this is to remove any of these pear seed berry ball things as soon as you notice them on the car. I'd also get the car washed as soon as possible. I'm guessing there must be some kind of acid or other chemical in the pear berries that react with the clear coat to leave the marks. If anyone else has experience or suggestions with this type of problem, please share your experiences.